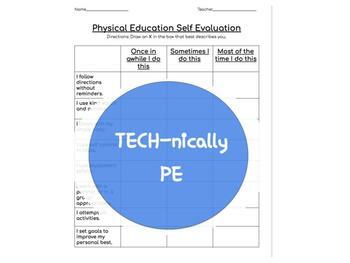 This self evaluation covers topics such as Cooperation, Responsibility and Effort in physical education. A great resource to use for formative assessment, goal setting, student growth, student portfolios, and parent teacher conferences. Copyright © Alexandra Braddock (TECH-nically PE). All rights reserved by author. This product is to be used by the original downloader only. This product may not be displayed digitally for public view. Failure to comply is a copyright infringement and a violation of the Digital Millennium Copyright Act (DMCA). Clipart and elements found in this PowerPoint File are copyrighted and cannot be extracted and used outside of this file without permission or license. Intended for classroom and personal use ONLY.